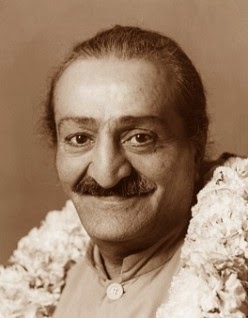 Today is Amartithi: the anniversary of the day my spiritual master, my inner guide and dearest friend, Avatar Meher Baba, dropped His physical form. If you have any interest in Meher Baba—and/or my connection to Him—you might want to read this post I wrote in 2013. Or you could just spend some time in the Silence of His Love. "God does not read what your pen writes. He hears what your heart sings." Moonshadow changed that—and changed the course of my creative life in the process. Someone (and for the life of me, I can’t remember who!) once said that whatever story you’re working on should be written as if it’s the only one you’ll ever tell—pouring all your thoughts, feelings, ideas, ideals, passions, philosophies, hopes and dreams...every iota of Who You Are...into it. That’s what I did with Moonshadow. It allowed me to step outside the Marvel-DC mindset and discover my own voice: over the course of those twelve issues I stopped being a “comic book writer” and become a writer. Of course it didn’t hurt that I was working with Jon J Muth, as brilliant an artist—and wonderful a collaborator—as the medium has ever seen. His work always challenged me, dared me to reach beyond my comfort zone and be better than I’d ever been. I hope I did the same for him. Jon J and I had three wonderful editors watching our backs—Laurie Sutton, Margaret Clark and the late, great Archie Goodwin—all of whom allowed us to tell our story in exactly the way we wanted, providing tremendous support and encouragement throughout our entire run. 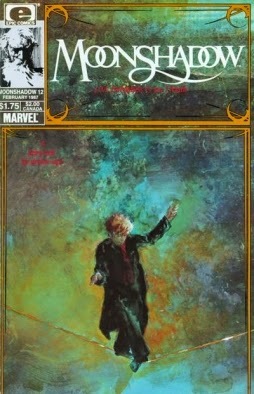 I also have to tip my hat to our extraordinary letterer, Kevin Nowlan, and two equally-extraordinary artists, Kent Williams and George Pratt, who pitched in to help Jon J when deadlines got tight. And let’s not forget Marvel’s then editor-in-chief, Jim Shooter, who gave my oddball pitch his approval, then sent me over to Archie G. “This is an Epic comic,” Jim said. And he was right. 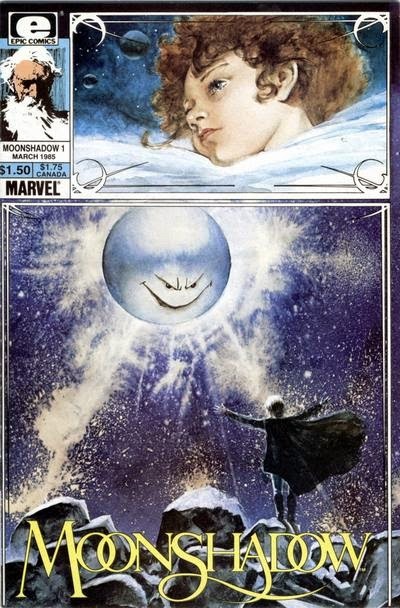 According to this post, the first issue of Moonshadow came out on Janurary 29, 1985—which means that Moon, “Sunflower,” Ira, Frodo, the G’l-Doses, the Unkshuss family and all the rest are thirty years old today. I wish them—and everyone who took that life-changing journey with me—a very happy birthday. I say “could have been” because, after I fleshed out Stan and Dwayne’s tale and wrote a detailed outline (trying to do justice to the brilliant absurdity of their idea), the Powers That Be gave “Misfortune Cookies” a very enthusiastic thumbs-down and the story was consigned to limbo—and that’s where it’s been for the past decade. When I came across the outline the other day, I thought it would be fun to rescue this oddball story and share it here at Creation Point. So I invite you to turn on the television set in your mind, unleash your inner animators and enjoy this lost episode of Justice League Unlimited. And let’s not forget that JLU and all the characters are ©copyright 2015 DC Entertainment. Before the inane conversation can continue, a very grim MARTIAN MANHUNTER enters the lounge, carrying a bag of Oreos (not mentioned by name...but clearly identifiable by their look); he munches on the cookies continuously -- also exhibiting a few minor, but noticeable, nervous tics -- as he addresses the group. J’onn tells E-Man and the others that the League is involved in a very delicate diplomatic situation. Two alien races -- the feline Hasssa and the not-remotely-humanoid SHROND -- are on the verge of war. In a last ditch effort to preserve the peace, each Empire is sending emissaries to the Watchtower in hopes that the League can mediate the dispute. INT. THE TRANSPORTER ROOM - DAY: The disgruntled and embarrassed Booster, Bwanna and Flash prepare to be beamed out. “Dontcha think,” Elongated Man observes, “that J’onn was acting a little weird...even for J’onn?” “Face it, Ralph,” Flash says, “you bring out the worst in people.” E-Man’s nose begins to twitch. “I smell a mystery,” he says. Flash: “I hate it when you do that.” E-Man: “It’s one of my most charming traits.” Flash: “You don’t have any charming traits.” But E-Man’s not listening: he’s lost in thought. “Coming?” Bwanna Beast asks. “I...ah...left something in the Lounge,” E-Man says. “You guys go on ahead.” They beam out and Ralph stands there, pondering. As he does, another one of the teleporters kick in...and a six foot tower of Oreo packages appears on the pad. EXT. SPACE - NIGHT: Two alien ships in orbit around the Watchtower. The Hasssa Emissary takes J’onn’s hand in hers -- “The Martian’s reputation precedes him” -- shakes it. We HEAR a CRUNCH. J’onn opens his hand: there are two crushed Oreos there. He downs them, crumbs flying everywhere, the Hasssa appalled as some land on her fur. “A pleasure to meet you, Ambassador,” J’onn says, through his stuffed mouth. ...and J’onn vomits, all over the alien emissaries. Everyone stands in shocked silence, especially J’onn. ...as Ralph leads the two emissaries toward the door, yammering as he goes: “Now let’s get you two cleaned up...grab a quick bite to eat....maybe unwind and watch a little television.” “Television?” the Hasssa asks. “The highest reflection of Earth culture,” Ralph says, ushering them out the door. ...who is standing in the corner, shoving Oreos down his throat at an alarming rate. They look at him. He looks back: “What?” J’onn says. INT. A WATCHTOWER CORRIDOR - NIGHT: GL and J’onn (who’s sweating now) striding down the halls of the Watchtower...J’onn, of course, munching cookies all the while. “What,” GL asks, “was that all about?” “A...minor illness,” J’onn replies, “but it’s passed.” “Minor illness?” GL replies. “First of all, I wouldn’t exactly call puking on the ambassadors minor...and, second of all, you never get sick! You’re a Martian!” J’onn stops, and his expression looks first confused, then outraged: “A Martian?” he says telepathically, his thoughts burrowing into John Stewart’s mind (and it’s clearly not a pleasant experience for GL). J’onn enters, a worried John Stewart behind him. “We will waste no more time, Madame Ambassador,” J’onn says, bowing to the emissaries. He asks them to return with him to the conference room, where they can now officially begin the negotiations. But as he does this..
...he reaches into his cape for another cookie. And he’s completely out. A look of panic washes over J’onn’s face -- “Oh, no!” -- and he becomes invisible. The door to the room opens and closes (although the emissaries don’t notice it). The Hasssa emissary almost attacks the Shrond again, but Ralph intervenes. “Hey,” Ralph says, nonchalant, “don’t worry, I -- “ And then, suddenly, the impact of those words hits him. “Maybe Superman should do this.” John looks over at the emissaries. “He’s unavailable. Besides, we change horses now and those two are gonna go ballistic. Don’t screw up, Ralph.” E-Man: “When have I ever screwed up?” Beat. “Don’t answer that.” A disgusted GL turns and leaves. “Heaven help us,” he mutters. INT. THE CONFERENCE ROOM - NIGHT: The Atom, using what looks like a high-tech pooper-scooper, is collecting samples of J’onn’s “H'ronnmeer hurl” as well as some cookie crumbs; studying the scooper’s LED readout as he does so. “What are you doing?” Ice asks. “I’m not exactly sure,” the distracted Atom says. “Well, that’s helpful,” says Fire. “I think it might be,” Atom says, taking his samples and heading for the door. “Has everyone around here’s gone nuts?” Fire wonders. “He’s trying to help,” Ice observes. “If he really wanted to help,” Fire replies, indicating the vomit, “he would’ve cleaned the rest of that up.” Ice covers the offending spew in ice, which will at least neutralize the stink. Ice and Fire get an urgent call on their com-links from John Stewart, asking them to meet him outside J’onn’s quarters. Now J’onn gets angry again, interrupting Atom: “It’s nothing that I can’t control. And it is none of your business.” GL gets in J’onn’s face. “Of course it’s our business. You’re our teammate.” “Our friend,” Ice adds. “Not to mention,” Fire interjects, “the little matter of that intergalactic war you’re supposed to be stopping.” The mention of the war seems to bring J’onn back to himself. “Yes, the war...” And then, again, he grows dark, agitated. “I am in command of myself,” J’onn says, stuffing his face now. “I control the cookie,” he continues, shoving more and more Oreos in, “the cookie does not control...” Then he stops, frightened, fully realizing what he’s doing. ...the battle carrying them all over the Watchtower: a brutal mess. They HEAR the NOISE OF BATTLE OUTSIDE. All three rush to the door to see J’onn and the others fighting their way down the corridor...then vanishing around the turn. And once again the two ambassadors start going at each other...and this time they each pull out blasters, demolishing half the lounge in the process. Desperate to stop them, Ralph wraps himself around and around the two emissaries, binding them together, face-to-face: they can’t move, they’re stuck that way. “Release us!” the Hasssa demands. “Or you shall pay with your worthless human life!” the Shrond adds. “I think,” Ralph offers, taking on the tone of a therapist, “that we need to get to the root of your anger. Aggression like this doesn’t just appear overnight, you know. It begins very early in life. Now tell me,” he continues, turning toward the Hasssa, “about your childhood.” And, suddenly, there’s an expression of extreme vulnerability on the Hasssa's face...as if Ralph has just pushed a primal psychological button. ...J’onn’s body solidifies -- and he effortlessly smashes out of the ice-block, the impact sending Fire and Ice flying. Ice struggles to her feet, imploring J’onn to give himself up. But J’onn is so feverish now, so crazed, that he just picks her up and smashes her against the wall. And now Fire’s seeing red: “You. Hurt. Tora.” She explodes in an inferno of green flame, barraging J’onn, dropping him to his knees. (Fire being the one thing that can stop a Martian.) Fire’s so angry, she keeps pouring it on and pouring it on. J’onn collapses, toppling flat on his back. EXT. THE WATCHTOWER - NIGHT. A massive Hasssa battleship suddenly warps into orbit around the Watchtower. ...the table gets up (its four legs growing longer)...and runs away, barreling past the amazed Gl and Atom. INT. A WATCHTOWER AIR VENT - NIGHT/ON J’ONN: He’s hidden himself away in the vent. Deathly sick now. Feverish, sweating. Delirious and pathetic. Hands shaking violently...as he licks cookie crumbs off them. He desperately searches his cape: nothing there. Then he puts a hand to his head and telepathically scans the Watchtower. “No,” he whispers, horrified. “No,” he repeats, “I’ve eaten them all.” He tries his com-link, hoping to reach the manufacturer on Earth: nothing but static. It’s dead. As the Leaguers try to subdue him, as he battles desperately against them, J’onn morphs and morphs...from his true Martian shape to the forms SUPERMAN, WONDER WOMAN, HAWKGIRL, FLASH, AQUAMAN. All of “them” speaking with J’onn’s voice. All of “them” pleading -- even as J’onn continues to fight savagely -- to be let off the station. ...and escapes again. Fire and Ice sprint after him. Atom checks his Palm Pilot-device. “How much time?” GL asks. “Physiological meltdown in approximately...seventy-two seconds.” “We’re not gonna make it, are we?” GL asks. Atom’s stunned silence is all the answer John Stewart needs. INT. A WATCHTOWER CORRIDOR - NIGHT. The feverish, confused J’onn is running, stumbling -- but, in his current state, he has no idea where he’s going, what he’s doing. And his belly is getting bigger and bigger and bigger...PULSING and CHURNING and RUMBLING. INT. THE SHROND BATTLESHIP - NIGHT: The SHROND CAPTAIN studies the chronometer: “The deadline is up in two Earth minutes,” he says. “Prepare to destroy the Watchtower and then open fire on the Hasssa ship.” “But our emissary -- ” says the FIRST OFFICER. “Is expendable,” burps the Captain. INT. THE LOUNGE - NIGHT: Ralph’s got the two emissaries crying their eyes out (and in the case of the multi-eyed Shrond, that’s quite a feat). ...J’onn bursts in. He’s GROANING as if he’s in incredible pain. There’s a psychic wave -- like a high-pitched electronic signal -- rippling from his mind through the minds of E-Man and the emissaries. Driving them to their knees. -- but they’re instantly downed by the psychic sound wave. J’onn is on the floor, in his natural Martian form...looking extremely emaciated; depleted and weak. He GROANS. The Watchtower is suddenly rocked by blasts from BOTH the alien battleships. INT. J’ONN’S QUARTERS - NIGHT: The Martian sits alone, staring at an empty Oreo wrapper. A beat, an inner struggle, a SIGH...then he balls up the bag and hooks it into the trash.